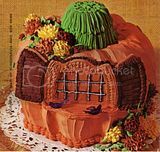 Did someone mention Pumpkin house? I made this many, many, many to the 5th power, years ago. It's from a 1973 cookbook put out by Nordic Ware and included with a Bundt Pan I bought.